Simple File Uploader -- I use this everyday. If you can not use cronjobs but want to make use of Geeklog's "daily digest" feature, then this plugin is for you: It lets you send out the digest email manually. Section admin e incomplete but u can manage, I think.. This is the Simply Chinese (gb2312) language page for GeekLog! this is a corrected french translation from the original file provided with Geeklog 1.3.7sr1. I corrected mainly errors in fonts (accents) and a lot of spelling errors. Fixed problem with polls buttons. The Open Directory Project is a categorized searchable human maintained web directory. With over 3.6 million links you can quickly find its power. 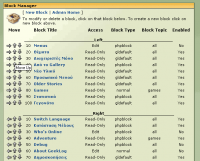 The core functionality of Geeklog does not give you an easy way to rearrange your blocks around. You have to edit each block and change the order number and wait for the page to reload, only to see that the order number "collides" with another and so on. For plugin developers: This is meant as a sample implementation of the profile-related plugin API functions introduced in Geeklog 1.3.8. It is NOT very useful for anything else ... Please read the enclosed README carefully. This is the first release. Use the UTF-8 Unicode encoding, if you want to use it , You do not put "AddDefaultCharset=utf-8" in your Apache Server Config. Updated for 2004! - Almost completely re-coded from the ground up, this new version features nearly all CSS rendered pages and WC3 HTML 4.01 transitional compliance. Originally designed with simplicity in mind, version 3.2 adds better text rendering and all new images, without compromising it's roots as a clean theme focusing on showcasing your content. Helps fight the problem of comment spam. A script to optimize the tables of your Geeklog database with the click of a button (you can do the same with phpMyAdmin - this is just easier to use ...). Update: Added a second version of the script that can be called from a cronjob. 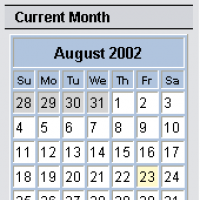 Mini Site Calendar Block that can be used to show site updates for a date when date on calendar block is selected. Dates are highlighted if there are main calendar events. Tool tip help shows event titles for quick viewing. Version 2.6 of this block - updated for GL1.4.1 and refactored to now use templates for easier editing of layout. An easy to use CafePress integration script. Edit two lines and place in your public html folder. See change file for details. This release addresses a couple of IE compatablility issues. This is the DailyQuote plugin for GL 1.3.9/10/11. It's most basic function displays a random quote in a PHP block or a center block. It is configurable to deliver much more functionality than simply displaying a random quote, e.g. : quotes may be cached; quotes may be searched and displayed; quote submissions may be moderated; permissions are configurable; and more. New to this version is a backup/restore function. Spamx addon to block comments by the IP of a url in the comment. CafePress Integration Script. GL 1.3.10 and up. The Open Directory Project in your Geeklog. This code shows an overview of all topics that the current user is supposed to see, together with the icon of the topic and a link to the topics storylist. The code is derived from functions in lib_common.php. Now the static page is better suited for menus. - added dimension setting for icons so you can shring them! Just upload a directory of images and it will make a gallery of thumbnails that cache, and show within your Geeklog site. It doesn't use any of the plugin api so be sure to read the geeklog_readme.txt for install instructions. Displays links from one category in a block. Links can be sorted or in random order. Static page php code to display Picasa generated web gallery folders as a portal to those web gallery pages. 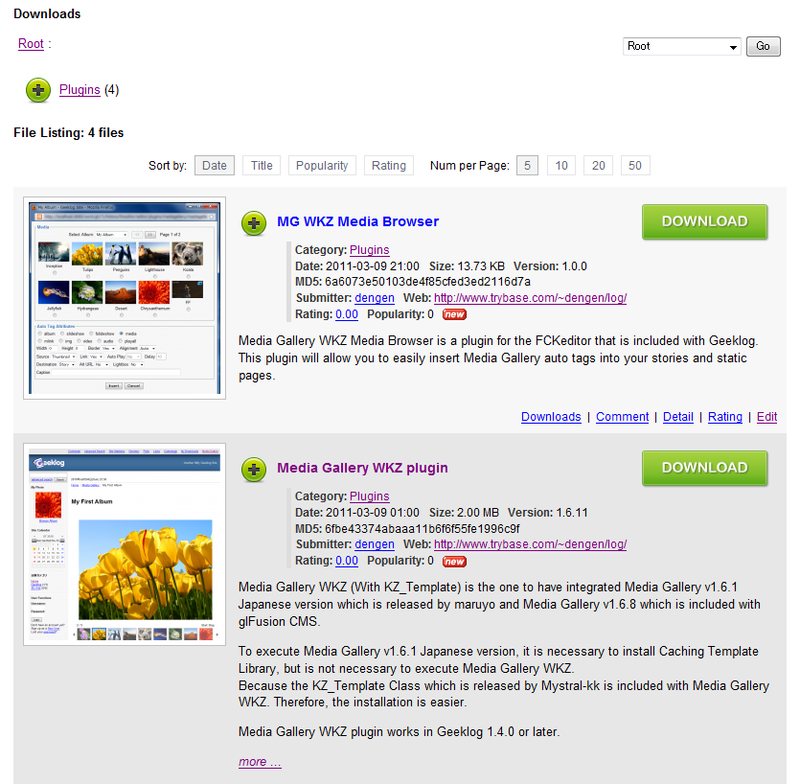 The static page lists the web gallery folders available, displays a random photo from the gallery, and the name of the folder of the gallery as links to those galleries. You must use Picasa to generate the webgalleries. A PHP block for Geeklog 1.3.x so users can invite friends to visit/register your geeklog site. This archive contains a more complete version of Geeklog Ukrainian translation than that of lokki; in fact, it was done half a year ago, shame on me I forgot to upload it. I think that coming to next version, efforts of us both have to be merged to produce the best result. This is a multilingual installer for Geeklog-1.4.1b2. English and Japanese language files are included. USAGE: Uncompress the archive file into your admin/install directory and run http://yoursite/admin/install/install.php. This is a bug-fixed version of Google Sitemap Generator. The users of the older versions should update to ver 0.1.3. Allows you to add a CafePress store to your site really simply. 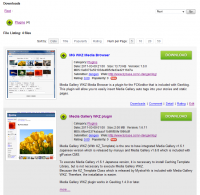 Media Gallery is an online multi-media gallery for Geeklog. 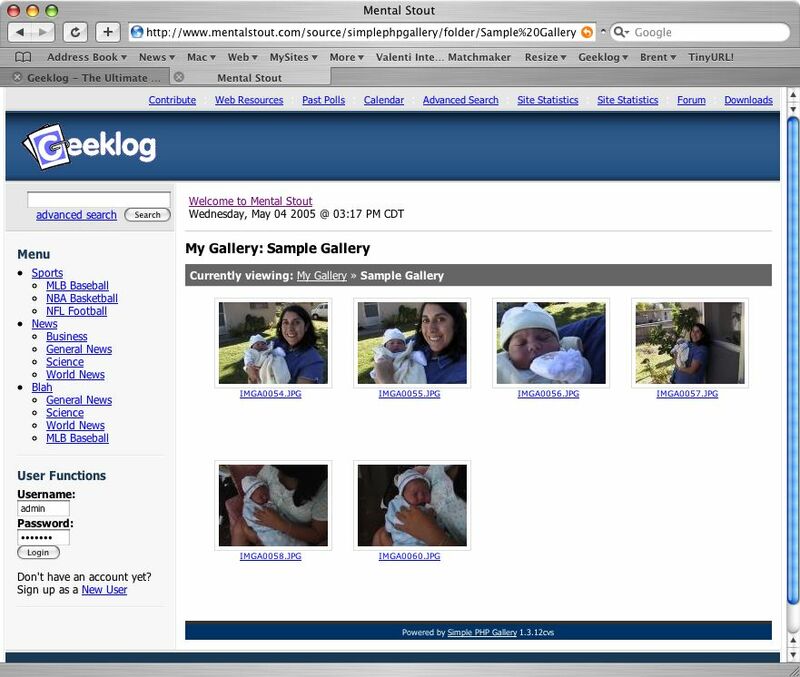 Media Gallery provides the standard features you would expect in a gallery program with tight integration with Geeklog. v1.5.0 brings many new features and improved stability. 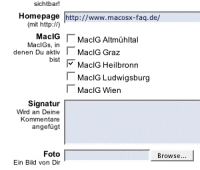 Version 2.7.2 (Jan 25/2009) - Security update that addresses an issue allowing a topic to edited by another user during the edit timeframe if the URL is modified. 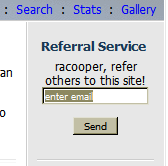 This is a simple hack to add asocial networking link for your site and for each article on your website. An updated version of Tom Willet's Nettools plugin that provides the Whois, NSLookup, Ping, and Traceroute networking tools. This version provides fixes to the Whois lookup, courtesy of the PHPWhois open source project. Downloads plugin adds downloads section to your Geeklog site. This plugin is derived from the famous Filemgmt plugin. And, adds various features. Put Classifieds Ads on your site in minutes. Classifieds plugin allows your site members to publish ads on your site. They can add pictures if necessary, modify and delete their ads at any time. Ads are online during a period that you can set. You can create as many headings and sub headings as necessary. [new] Warning message for no group with publish right or group list with publish right.